Moving to a new home, whether local or long-distance, is generally not considered an environmentally-friendly process. However, there are some easy steps you can take to reduce waste and limit your carbon footprint for a more eco-friendly move. Before and during packing, it is a good idea to consider which items you would like to bring with you when you move. For the items you decide to get rid of, you have a few options to consider: sell, donate, recycle, or trash. If you have items of value or usefulness that are in good condition, one option would be to sell them. You can hold a garage sale or try selling online with marketplaces such as Craigslist, Facebook Marketplace, or eBay. For clothing items, check out sites such as Poshmark and ThredUp. Another option besides selling unwanted possessions is to donate them to local charities. This helps keep the items out of landfill while supporting a cause. Organizations such as Goodwill or St. Vincent de Paul typically accept clothing, linens, furniture, other home goods, books, movies, and other miscellaneous items. What about that shirt that has a giant stain on it, or your favorite pair of jeans you wore so much they ripped? You can still donate them! Textiles that aren’t able to be sold in the store of a donation center are recycled into rags, building insulation, upholstery stuffing, and fabric. If you have items that are in poor condition or don’t fit in the sell or donate categories, you can choose to recycle them. While some items can go with your household recycling, others need special considerations to recycle. If you have batteries, electronics, appliances, or chemical substances such as paint or varnish, make sure you take them to the appropriate recycling centers so they can be disposed of safely. Ideally, the amount of items that end up in the trash pile is minimal compared to the other categories and only consists of things that can’t be sold, donated, or recycled. Moving boxes are traditionally made of cardboard. While they are recyclable, there are alternatives to going out and purchasing a set of boxes specifically for your move. Used moving boxes – Ask friends & family or check online marketplaces to see if anyone is selling or giving away boxes suitable for packing. Commercial shipping boxes – Check with the local grocery stores, book stores, restaurants, and other retailers that may have extra cardboard boxes from receiving shipments. Luggage – Suitcases, especially ones on wheels, can be useful for packing heavier items such as books. The wheels allow you to roll them rather than carry them, and a full suitcase is more helpful to move than an empty one. 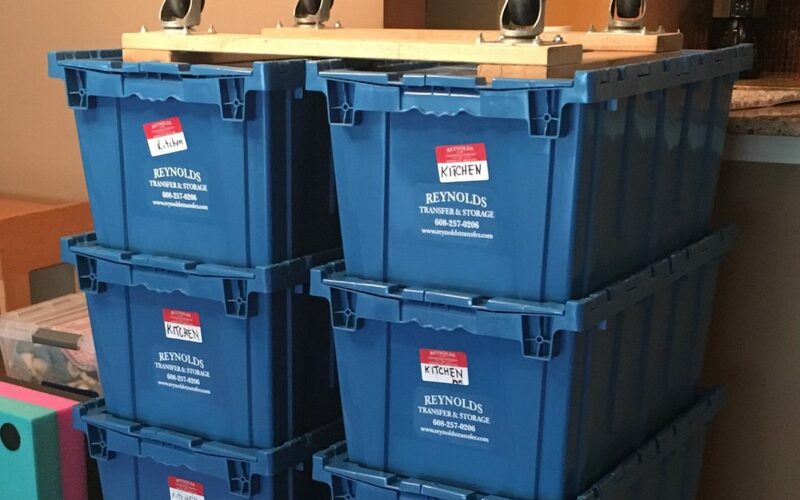 Plastic bins – Plastic bins, such as Reynolds’ Eco-Boxes, are reusable, strong, and stackable while being eco-friendly. They also eliminate the need for packing tape and don’t need to be disposed of following your move. You want to make sure your belongings are protected while packing them, but not all packing materials are good for the environment. When packing breakable items, start with what you have. You can use towels, sheets, comforters, pillows, blankets, and clothing to cushion fragile items. If you need more packing supplies, use recyclable materials you may have on hand, such as newspapers and plastic grocery bags. If you need to purchase packing supplies, look for biodegradable or recyclable options. For the move itself, look for a mover with a focus on environmentally sustainable practices. For example, Reynolds offers the use of Eco-Boxes and has implemented several sustainability initiatives, including the addition of solar panels and rain barrels. Additionally, aim to move everything in as few trips as possible. This will help to reduce fuel use and emissions. Hiring a mover will help limit the number of trips you need to take. Once you are all unpacked and settled into your new home, properly dispose of your packing supplies. If you used cardboard boxes and they are still in good shape, offer them to someone else to use for their move. If cardboard boxes are no longer structurally sound or strong enough to be used for more packing, recycle them. This is also a good time to consider the environmental impact of your new home. You can start small by replacing incandescent light bulbs with LED light bulbs, using eco-friendly cleaning products, and installing a low-flow shower head. If you’re looking for an eco-friendly moving company to help with your upcoming move, contact us for more information!